I’m just a small town girl who loves all the beautiful things in life—design (interior and graphic), cooking, making things for my house, making things for others, typography, old books, and inspiring quotations. This blog is a collection of all those beautiful things. Enjoy! for my FIRST EVER blog post, i want to share a unique paper craft technique that i came across a few months ago on a blog i frequent, For Print Only. 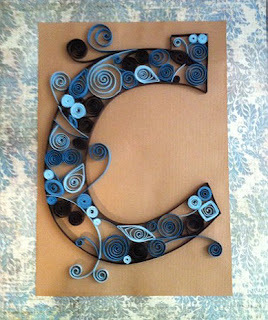 it is called QUILLING and while it looks pretty intense, it is so simple (and therapeutic) to do. you can try it for yourself by following my tutorial below. first, decide on an image that you wish to quill. so far, I have created letters, a cupcake, and an anchor. you can either print an outline of the image from your computer or hand-draw the image yourself (I chose the latter which makes it more unique). be sure to draw very lightly so you can't see the lines after they're covered with paper. next, you'll need to cut your paper into 1/4" strips. i use a ruler and a razor blade. now, the fun can begin! first, you'll want to choose your outline color and attach the paper strip around the outline you've printed or drawn. don't get frustrated with this step, because it is the hardest...once you have the outline complete, it's a breeze. use your quilling tool to roll the paper strips into the desired shapes and attach them inside your outline using adhesive. continue this process until you have filled in your shape! once complete, you can mount your quilled shape onto a patterned piece of scrapbook paper and frame. your family and friends will be blown away by this unique craft...little will they know it’s actually fun and easy to do! This is hanging in my bedroom and I love it! (among many other beautiful pieces of art you have created for me). I love you!! Hi, I'm Katherine (but my family and close friends call me Katie Beth). I met my husband, Casey, in the fall of 2004 when we shared a class together in college - we have been together ever since. Our family is finally complete with the recent addition of our precious little guy, Mason. We live in Murfreesboro, TN and enjoy being outdoors, working on projects around the house, taking oodles of pictures of our son, and just hanging out with friends and family. This blog is a place for us to document and share our lives with those around us. Enjoy!